Today's topic is the chart of the Islamic "Caliphate" declared last year by ISIS (the "Islamic State of Iraq and Syria, also known as ISIL, the "Islamic State of Iraq and the Levant". It is the closest we can probably get to a chart for ISIS itself, which has its roots in the US-funded "Mujahedin" during the Cold War and later morphed itself into "Al-Qaeda" and most recently "ISIS" -- largely with covert US government backing in its post-Mujahedin years (articles with some of this background are linked at the bottom). There have been multiple proposed charts for the caliphate published on the internet. I defer to authority here and will refer to the chart proposed by Geoffrey Cornelius and published on the Oxford Astrologer blog. In any event, the more original techniques I use here often do not require a precise time of day. Apollonian/Libertarian: Pallas ruler Mercury trine North Node. This combination puts us solidly in the "Criminal" quadrant of the Axis of Good and Evil, with the (decidedly non-guaranteed) potential of ending up somewhere in the "Statist" or even the "Libertarian" quadrant over time. If this potential manifests, this could either mean a "mellowing out" of the terrorist group (as has occurred with various parties in the Israel/Palestine region) over time, or a dissolution of the group entirely. 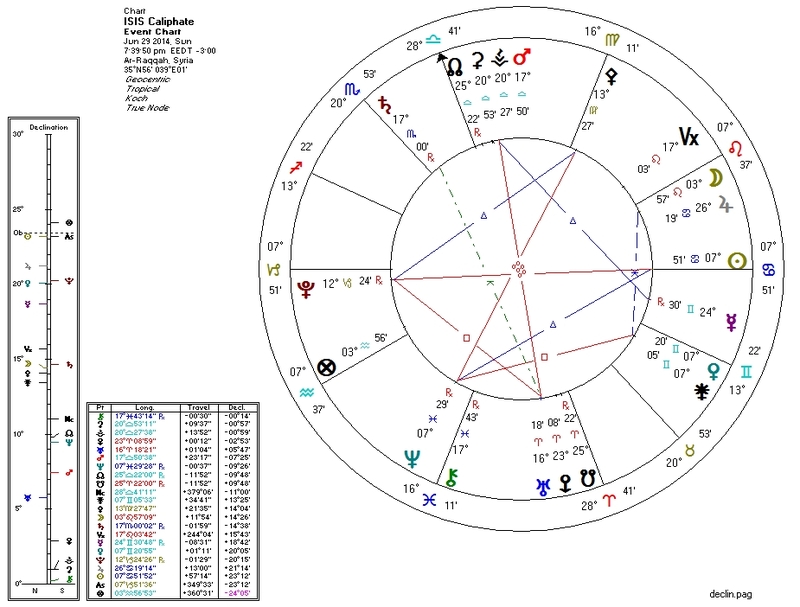 Capitalist: Venus ruler Mercury trine North Node. Collectivist: Venus square Neptune, in the Second house. Second House co-ruler Uranus conjunct South Node. The Leftist economic factors have it on this chart. This Caliphate probably won't be an entrepreneur's paradise. Conservative? : Moon in Leo conjunct Jupiter in Cancer which is square the Nodes. Liberal: South Node conjunct IC; Moon quincunx Neptune; Moon ruler Sun trine Neptune. On one hand, we have an over-the-top strong tendency to identify with and promote a particular idea of culture. On the other, we have multiple very strong impulses to destroy/dissolve culture. This, I think, reflects the ISIS mission of promoting its own extremist Islam by destroying every other culture. In most entities, this configuration would actually indicate a strong "liberal" leaning. 2. Venus square Neptune, in the Second house. 3. Venus contraparallel Pluto and ruled by Mercury which is quindecile Pluto. 4. Moon biquintile Pluto and ruled by Sun (opposite Pluto); Fourth House ruler Mars square Pluto. As we might expect from the extraordinarily bloody activities of this group, the Bloodbath Formula is unusually strong here. criminal ethics + collectivism + hyped-up cultural-revolutionism + homicidal tendencies? These folks are "Social Justice Warriors" on steroids, with guns. If we bear in mind that SJW's primarily attack liberal white Westerners who already believe in liberal "social justice", and ignore the truly unjust/sexist/racist cultures (Saudi Arabia, much of Islam, "hip-hop" culture, etc.) then we can more easily see the connection. Both ISIS and SJW's knowingly or unknowingly serve to weaken modern liberal civilization in favor of authoritarian control. Pluto in Capricorn Rising: interacting with the world by destroying its structure. Sun in Cancer on the Descendant: making its culture (Cancer) "shine" (Sun) in foreign lands. Saturn in Scorpio quincunx Uranus in Aries: disrupting power structures and institutionalizing disruption. North Node parallel Neptune: ISIS' destiny may lie in dissolution, or genuine spirituality, or in drug trafficking... only time will tell.